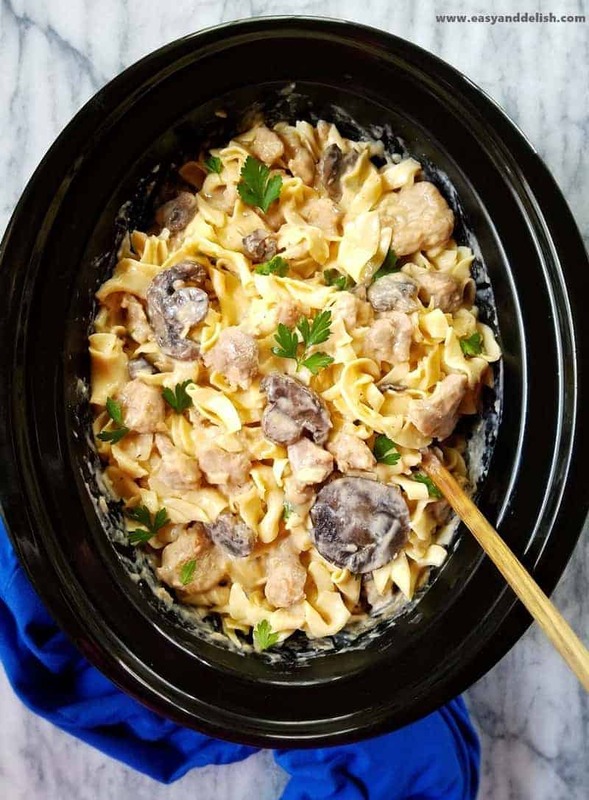 Slow Cooker Lean Pork Stroganoff is an easy and comforting dish ideal for those busy weekdays. Serve this healthier version over egg noodles or accompanied by a hard crusted bread. … white wine, tomato paste, diced onions and garlic, sliced mushrooms, sour cream, and fresh herbs. Although it is totally delish accompanied by white rice and shoestring potatoes like our Chicken stroganoff, this time we served it over egg noodles. If desired, you can even avoid the extra little hassle of preparing a side by serving it simply with a hard-crusted bread. Place pork meat in a large bowl and reserve. Mix 1/4 cup of flour with 1 teaspoon of salt, pepper, and paprika in a small bowl. Dust mixture over the pork meat and mix well until pork pieces are covered with the flour mixture. Heat oil over medium-high heat in a large non-stick skillet. Add the pork meat and let brown for about 5-7 minutes, stirring occasionally. 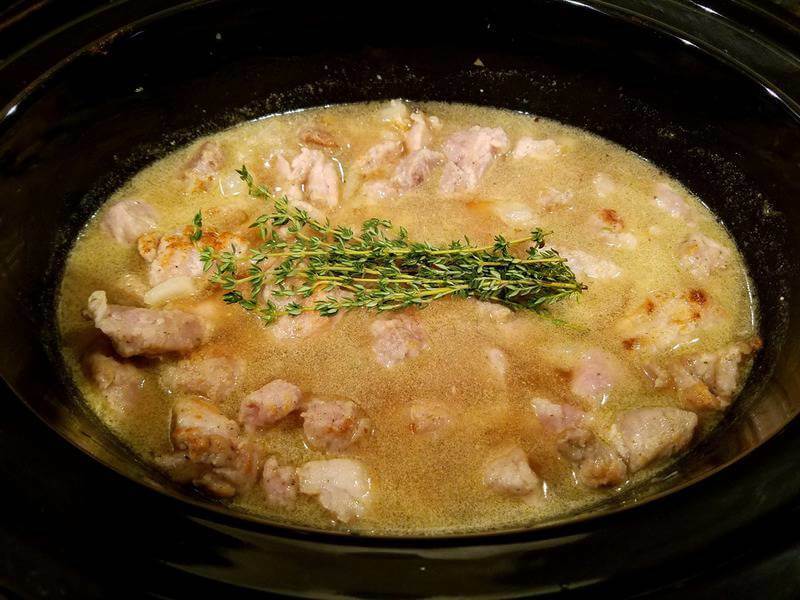 Transfer the pork meat to a slow cooker and add the onion and garlic. Reserve 1/2 cup of broth and add the rest to the slow cooker. Stir in the wine, tomato paste, and remaining 1 teaspoon of salt . Add the mushrooms and fresh thyme. 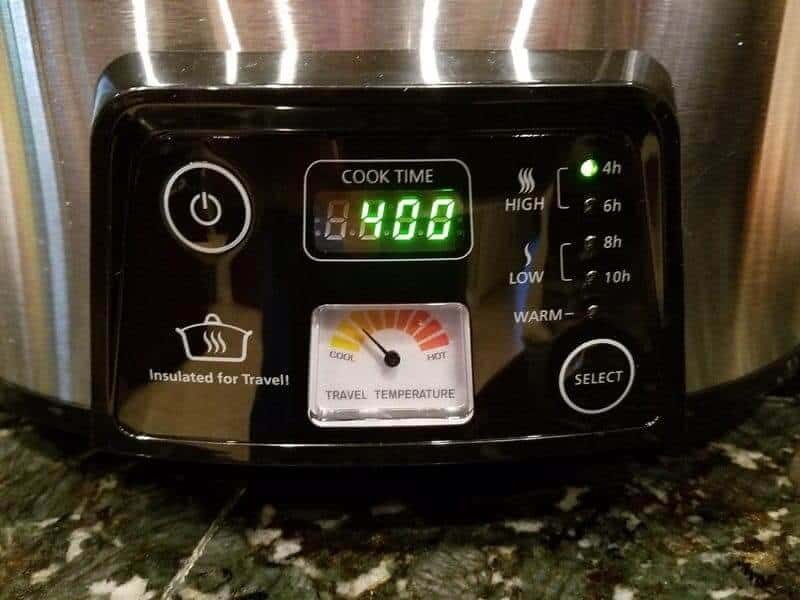 Set the timer on high for 4 hours. Remove thyme sprigs. Dissolve the remaining 2 Tablespoons of flour in the 1/2 cup reserved broth stirring until no lumps of flour are found. Add to the slow cooker and stir until sauce thickens. Stir in the sour cream well. If necessary, adjust the seasonings. Serve over egg noodles, or over white rice garnished with fresh parsley and accompanied by shoestring potatoes. Enjoy! Ours is a variation of the classic Beef Stroganoff, which was originally a 19th century Russian dish made with sautéed pieces of beef served in a sauce with sour cream (smetana)!!! The dish has become popular all around the world, and has come to include different variations of the type of meat used, as well as the other ingredients. Of course, in addition to a diverse group of accompaniments. Egg noodles are among the most popular accompaniments. Although this dish can be prepared in approximately 45 minutes in a regular pan, this time we preferred to set our slow cooker and in the meantime go about our other tasks. The advantage of the slow cooker over a regular pan is that the stew can cook unattended overnight or any other time of the day. Just set the timer, and relax! So yes, dinner will be ready within 4 hours but with no hassle. I hope you enjoy our Lean Pork Stroganoff as much as my family and I did. 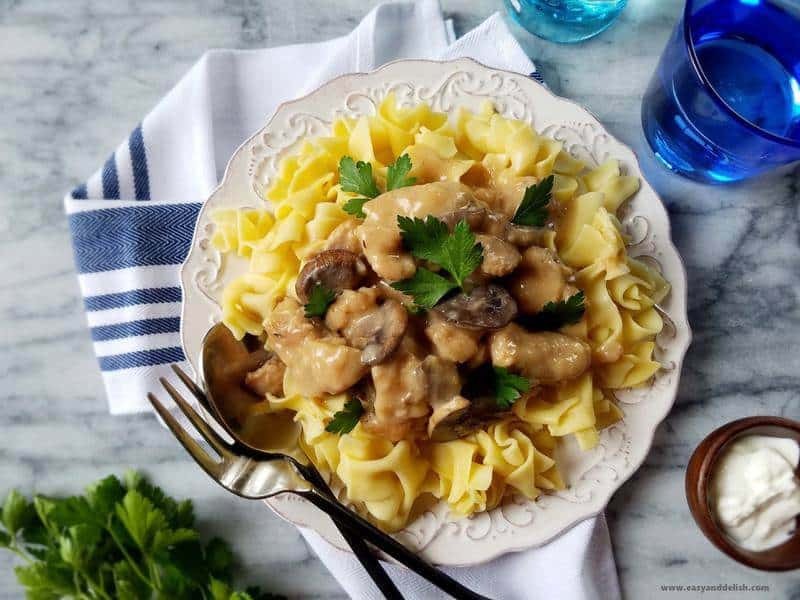 Slow Cooker Lean Pork Stroganoff is an easy and comforting dish ideal for those busy weekdays. It can be served over egg noodles or accompanied by a hard crusted bread. Mix 1/4 cup of flour with 1 teaspoon of salt, pepper, and paprika in a small bowl. Dust mixture over the pork meat and mix well until pork pieces are covered with the flour mixture. Transfer the pork meat to a slow cooker and add the onion and garlic. Reserve 1/2 cup of broth and add the rest to the slow cooker. Remove thyme sprigs. Dissolve the remaining 2 Tablespoons of flour in the 1/2 cup reserved broth, stirring until no lumps of flour are found. Add to the slow cooker and stir until sauce thickens. Stir in sour cream/yogurt. Alternatively, a hard crusted bread can accompany the Slow Cooker Lean Pork Stroganoff instead. To make this stew gluten-free, omit flour completely. Use 1 TBSP cornstarch instead of the 2 TBSP of flour dissolved in the broth to thicken the sauce. HI Denise, who wouldn’t enjoy coming home to a wonderful meal like this, looks delicious! A slow cooker is such a time saver! Dinner never looked better! I’m a fan of egg noodles with any kind of stroganoff, they meld perfectly with the fabulous sauce. 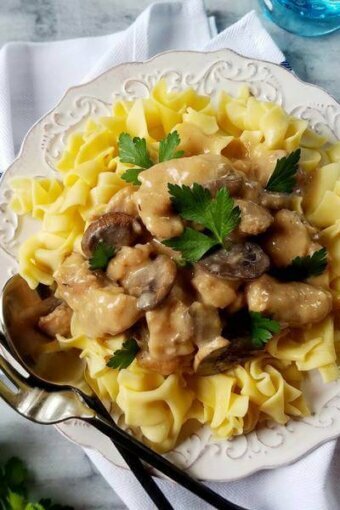 Love the wonderful taste of stroganoff but have yet to make it with pork…thanks for the inspiration. 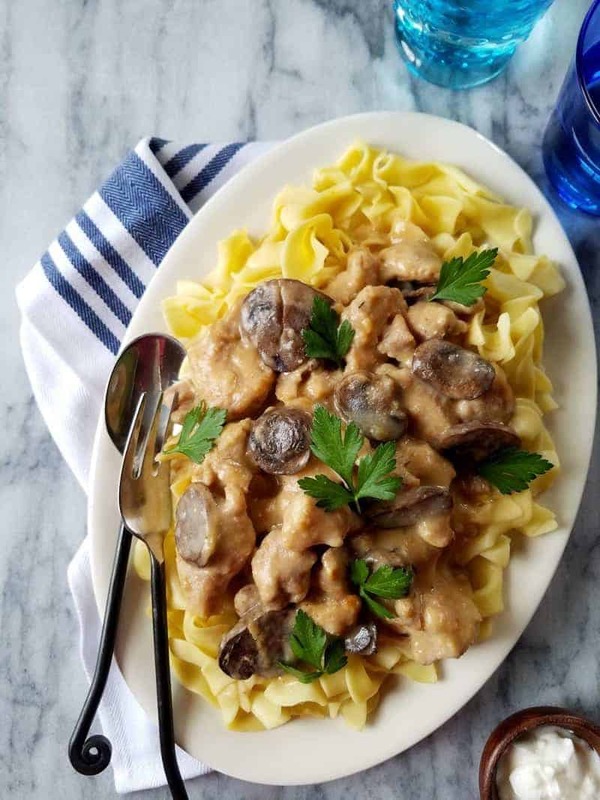 Oh Denise, this pork stroganoff looks so good…you really make me feel guilty as I have a brand new slow cooker and have yet to use…thanks for the recipe. I have just updated the recipe to include fresh thyme and parsley among the ingredients. I apologize for their omission in the recipe. I hope you give this stroganoff a try and enjoy. Have a wonderful day! This, I will save it because for sure more than one is going to be happy at home with this deliciousness! I made it with beef and it was delish! Good to know Stroganoff is slow cooker friendly. 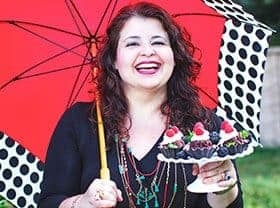 Not too long ago I was looking a person making this dish and I thought “I would like to make it” and I found your recipe. I can’t wait to try it. This has the most amazing flavor. Loved it! Hi when do you add the Greek yogurt at the end or when everything else goes in? Hi, Angie! The sour cream or Greek yogurt must be stirred in at the end, after sauce is thickened with flour. I apologize because I added this step on the body of my post yet forgot on the recipe card steps. But I have just fixed it. Thank you for letting me know. I hope you make this pork stroganoff and enjoy. Happy Easter! Made it this afternoon and added yogurt at the end. Went down a treat and everyone thought it was delicious. So glad to hear Angela! You did the right thing. Sorry that I got your comment late but I am happy everything turned fine. Happy Easter!